dGB Earth Sciences created the OpendTect project, computed derived attribute volumes and interpreted horizons. This Self-Study course in an excellent introduction to all aspects of OpendTect and Plugins. The exercises in the manual are specifically written for the F3 demo survey. License key protected parts of OpendTect (OpendTect Pro and the commercial plugins) can be used on this data set without license keys because the software does not check for license key when it runs on this data set. Seismic Sequence Stratigraphy, Channels, Sandwaves, Glacial plowmarks, Surface expressions, Pockmarks, Shalow biogenic gas, Gas Chimneys, Bright spots, Flat spot, Faults, Dewatering Faults, Zechstein Salt dome. F3 is a block in the Dutch sector of the North Sea. The block is covered by 3D seismic that was acquired to explore for oil and gas in the Upper-Jurassic - Lower Cretaceous strata, which are found below the interval selected for this demo set. The upper 1200ms of the demo set consists of reflectors belonging to the Miocene, Pliocene, and Pleistocene. The large-scale sigmoidal bedding is readily apparent, and consists of the deposits of a large fluviodeltaic system that drained large parts of the Baltic Sea region (Sørensen et al, 1997; Overeem et al, 2001). The deltaic package consists of sand and shale, with an overall high porosity (20-33%). Some carbonate-cemented streaks are present. A number of interesting features can be observed in this package. The most striking feature is the large-scale sigmoidal bedding, with text-book quality downlap, toplap, onlap, and truncation structures. Bright spots are also clearly visible, and are caused by biogenic gas pockets. They are not uncommon in this part of the North Sea. Several seismic facies can be distinguished: transparent, chaotic, linear, shingles. Well logs show the transparent facies to consist of a rather uniform lithology, which can be either sand or shale. The chaotic facies likely represents slumped deposits. The shingles at the base of the clinoforms have been shown to consist of sandy turbidites. The original F3 dataset is rather noisy. To remove the noise, a dip-steered median filter with a radius of two traces was applied to the data. Within the survey, four vertical wells are present. All wells had sonic and gamma ray logs. Only two wells (F2-1 and F3-2) had density logs. These logs were used to train a neural network that was then applied to the other two wells (F3-4 and F6-1) to predict density from sonic and gamma-ray logs. Porosity in all cases was calculated from density using the formula: Porosity = (2.65 - Density) / (2.65 - 1.05). Aminzadeh, F., and De Groot, P., "Neural networks and other soft computing techniques with applications in the oil industry", EAGE Book Series, 2006. Wolak, J., Hemstra, N., Ochoa, J., and Pelissier, M. (2013). 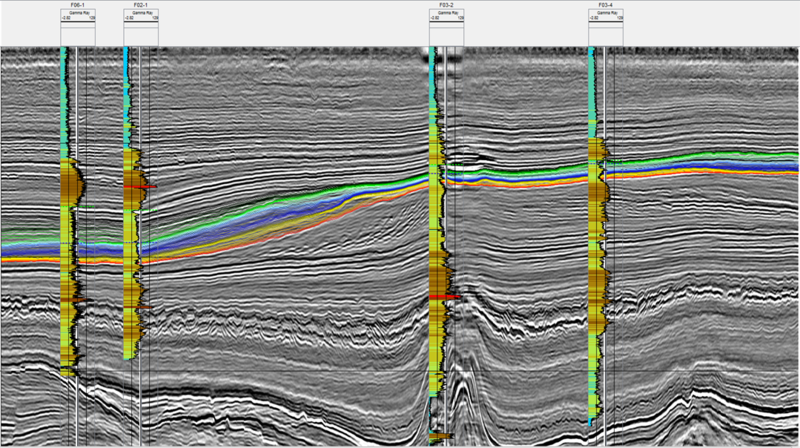 "Reconstruction of depocenter evolution through time using relative stratigraphic thickness." The Leading Edge, 32(2), 172-177. Kumar, C. P., Naim, F., Mohanty, S., Seismic Expression of Polygonal Fault Systems: An example from North Sea, Dutch Offshore, SPG-SPE Conference, Beijing, 2016. Overeem, I, G. J. Weltje, C. Bishop-Kay, and S. B. Kroonenberg, 2001 The Late Cenozoic Eridanos delta system in the Southern North Sea Basin: a climate signal in sediment supply? Basin Research, 13, 293-312. Qayyum, F., Catuneanu, O., de Groot, P., Historical Developments In Wheeler Diagrams And Future Directions, Basin Research, DOI: 10.1111/bre.12077, 2014. Qayyum, F., Catuneanu, O., de Groot, P., Developments and Future Trends in Wheeler Diagrams, 75th EAGE Conference & Exhibition incorporating SPE EUROPEC, London, UK, June 2013. Qayyum, F., P. de Groot, N. Hemstra, and O. Catuneanu, 4D Wheeler Diagrams: Concept and Applications, Geological Society, London, Special Publications, v. 404, 2014, p. SP404.1, doi:10.1144/SP404.1. Qayyum, F., Hemstra, N., and Singh, R., A Modern Approach to Build 3D Sequence Stratigraphic Framework, 2013, Oil and Gas Journal, vol.111, issue 10. Qayyum, F. and Akhter, G., 2008, Logical Expressions a basic tool in reservoir characterization, Oil&Gas Journal Volume 106.41, p33-42. Schroot, B.M. and Schüttenhelm, R.T.E., 2003, Expression of shallow gas in the Netherlands North Sea, Netherlands Journal of Geosciences / Geologie en Mijnbouw 82 (1): 91-105. Sørensen, J.C., Gregersen, U, Breiner, M and Michelsen, O., 1997, High frequency sequence stratigraphy of upper Cenozoic deposits. Mar. Petrol. Geol., 14, 99-123. An important aspect of TerraNubis is the possibility to create derivative work. For example, someone performed a seismic interpretation and makes this interpretation including all data files and interpreted grids available as a project for sale in TerraNubis. The seller permits 3rd parties to create derivative work for this project. This is a free choice for every project on sale. It means that any expert can work on this data set to create additional value-added products without paying the seller. It is explicitly forbidden to use the data for anything else then creating derivative work. The derivative work has to be sold exclusively via TerraNubis and always in combination with the original project.